Gyoji is the referee of the Battle Nexus. Gyoji is first seen in season two in the episode called The Ultimate Ninja. He is disliked by Raphael in his first appearance when he gave rules about fighting. Later he came back in Big Brawl and continued to serve the Ultimate Daimyo. He was sucked into a rift when Drako opened a portal in the Battle Nexus fighting arena. He would later return in the episodes The Real World, Part 1 though that would turn out to be Ultimate Drako in disguise, and Grudge Match. His appearance is similar to a Japanese priest. His little weapon had power as well but he didn’t do much with it. Gyoji doesn’t fight at all but as a referee he tends to stop other fights or set up fights in the future. To Raphael he is a annoying person and Raph does not get along with him but later his bitterness goes away after seeing Gyoji at the end of the Battle Nexus tournament. Gyoji is not by the Daimyos side all the time but sends guards to watch over him. 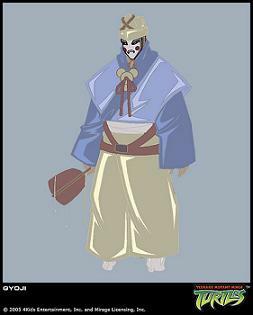 The Gyoji appears in the game Teenage Mutant Ninja Turtles 2: Battle Nexus. A gyoji is a traditional referee of the art of sumo. Gyoji gets the special honour of being one the first TMNT 2k3 characters to cross over into the Mirage TMNT comics themselves. In the Mirage comics, his name is misspelled “Gyogi”.